The blogger otherwise known as the Scientist Gone Wordy and I return to close not only the month, but the first half of 2014. Where the Hell has the year gone? And don’t say “…in a handbasket”, please. This time, we’ll do it with an espionage thriller of some repute. One that began its life 34 years ago between a book cover. For this, Rachel suggested something that had a connection with my reading past of long ago. In fact, I recall this was once a Book-of-the-Month Club selection. It’s how I came to read it. The former Marine turned theatrical actor and producer, Robert Ludlum eventually began writing suspenseful spy novels to make ends meet. With hundreds of millions sold before his death in March 2001, he certainly accomplished that. Plenty of his two dozen plus conspiratorial thrillers were read by me. Many of his fans consider The Bourne Identity to be one of his finest. I think it’s his best novel. Drawing on the only lead character the author ever reused in later sequels. A brief synopsis of the film: Miles off-shore of Marseille, France, a fishing vessel has laid claim to an unexpected catch. An unconscious man floating in the waves of a Mediterranean storm. Upon examination, he’s been shot in the back. Even more strangely, has a small device implanted in his hip divulging an account number to a Zürich bank. Moreover, upon regaining consciousness, the stranger claims to not know his name or any parts to his identity. He’s young, fit, and with skills that call into question his métier. As he sets off to find who he is, he’ll need help from the woman his path intersects, along with the physical expertise and prowess he seemingly possesses, to stay alive. For others tempered in the same dark tradecraft are trying to kill him. Like twelve years ago, I had an awareness as I approached this work by Ludlum once more for my film review. Re-reading the novel for the first time since 1980, and comparing it to its 2002 motion picture reincarnation in a post-9/11 world. While the book showed its age, it nonetheless made me re-appreciate the storytelling craft of the author. I think all thriller junkies like myself go through a spy novel phase. Hooked on the intrigue and unique art it offered. Over the years since its release, I’ve read a number of reviews and opinions that expressed that the two movie sequels to The Bourne Identity, both done by the English film director Paul Greengrass, were the best of the series. Well, they certainly were head-and-shoulders above the last one. Tony Gilroy’s The Bourne Legacy. However, while Greengrass’ approach upped the conspiracy, he simply built on the foundation Doug Liman put together that re-birthed one of the most compelling spy characters this side of the Atlantic. Director Limon’s father worked for the National Security Agency (NSA) under Ronald Reagan, and influenced the tack he’d utilize for his film. A fan of the novel since high school, Limon’s method was to re-introduce1 Jason Bourne to the film-going public in spectacular fashion. He and screenwriter Tony Gilroy came up with a means of modernizing the then twenty-plus year work to meet worldwide viewers’ expectations, and as a direct answer following the collapse of the World Trade Center’s towers. Jettisoned was the concern of 70s terrorism, epitomized by the real-life boogie man used in the novel, Carlos the Jackal, but kept the central premise of a highly skilled operative with amnesia. Now characters suffering some sort of amnesia have a longstanding in literature and film. From 1945’s Spellbound to the recent Shutter Island (2010), which was based on Dennis Lahane’s novel, and the throng in-between. Ludlum’s book and character, too, has been persuasive, even before its film adaptation. I’ve little doubt Shane Black’s similarly plotted script for The Long Kiss Goodnight2 (1996) re-used Ludlum’s idea of a skilled assassin losing his/her identity. Hell, if you drop the amnesia aspect of the novel entirely and just apply its deception to trap a terrorist, up pops John Frankenheimer‘s Ronin (1996). Again, don’t tell me writers J.D. Zeik or David Mamet hadn’t probably read The Bourne Identity at some time before scripting such. Still, the footing Limon placed under movie-viewers for this exercise in more modern, less gadget-filled spy fare upped the ante for others in the same trade. The novel a breakthrough that reverberated into Ian Fleming’s territory. As this film did with its venerable movie franchise counterpart. The 2006 reboot of Casino Royale clearly a response to what this filmmaker successfully accomplished. One that former ‘Q’ replacement John Cleese is not a fan of, it seems. Like its famed predecessor, it established a template for producers, and sequels, to follow. As Greengrass did with his, Limon falling back to executive producer duties. Based on ancient fighting techniques from the Philippines, kali offers close quarters combat, one the U.S. Special Forces and law enforcement now use. Director Gareth Evans continued the trend of Southeast Asian martial arts with his films featuring pencak silat. An enthralling, skilled, but damaged lead character? Check. Introduce a close-quarter fighting style to teardown opponents with and dazzle movie-goers? Kali, check (c/o Nick Powell). And add riveting chase sequences, on foot and/or in a car, through the corridors and avenues of an exotic location? Check and double-check. I don’t mean to sound trite, but it’s all there in the first film of the Bourne trilogy. Greengrass followed each of his succeeding sequels with increasing intensity that worked for the most part, my complaints aside3. Yeah, and director Martin Campbell would do the same with you know who. All I’m getting at is this. If The Bourne Identity didn’t get it right in the first place, a number of other action-thrillers don’t come about likewise. It was a gamble that paid off, one movies studios used in their most prevalent trait for the rest of the decade. Copying. Using an indie director who hadn’t enjoyed much box office success prior with the small films entrusted to him, and an actor who had an Academy Award on his mantle, but not for what you’d think. His screenwriting. Calculate the odds Vegas would have given this. Utilizing a long-in-the-tooth spy novel as a basis, the three all came together to catch lightning in a bottle. Although, Universal’s producers hedged their bets by surrounding them with experienced talent. Especially in supporting cast. Chris Cooper and the Scottish demi-god that is Brian Cox the standouts, for sure. Yet Franke Potente, Julia Stiles, Clive Owen, Adewale Akinnuoye-Agbaje, Gabriel Mann, and JUSTIFIED’s Walter Goggins weren’t chopped liver with their efforts, either. Tony Gilroy and William Blake Herron deftly crafted one of the best film adaptations around. They didn’t so much translate Robert Ludlum’s exercise in deception, dramatic revelations and reversals, but distilled the story down to its essence. One that would bring the confused and endangered protagonist from offshore Marseille all the back to where his trek began. New York City. Movie viewers would have to wade through The Bourne Supremacy to reach the heart of the subterfuge at the saga’s core with The Bourne Ultimatum. Needless to say, the author accomplished that feat in 500-plus pages. Limon and company would need three films to even come close. The irony here was Robert Ludlum’s subsequent sequels only went down in quality with each release of his next Bourne books4. It saddened this reader to write that. The opposite true for the film versions that borrowed those titles. I remember being skeptical about this movie, as I didn’t have much faith in Matt Damn’s ability to pull off playing Jason Bourne. But, like you, I was won over. I still haven’t seen The Bourne Legacy yet, but I’m planning to check it out. I’m going in without high hopes, as reboots are often tricky. But I am a fan of Jeremy Renner (he was great in The Town), so it has that going for it. Totally understand, John. I had my misgivings. Remembering it took two days for the miniseries to cover the novel. How were they expecting to pull it off in one two-hour set, I wondered. The trimming and direction accomplished it, though. There are good parts to The Bourne Legacy, and Renner does a good job (not as Bourne, though). Check it out and see if you have the same reaction as I. Thanks, my friend. Compared to the other two, it’s fine. But you can totally tell that the franchise was just getting started by this point. Good review. I agree with you that the first movie deserves more credit. I actually prefer the first over the Greengrass sequels. The sequels seem to offer more of the same rather than build on what the first had established and expand it. Good review. Sadly, I didn’t get around to watching this film until home video, but was hooked right from the opening scene. Such a great film and series that only got better with each installment, IMO. This is a great review of a film that deserves more credit Michael. Yes it’s totally different from the novel but it worked for me. I actually was very disappointed with the film when I first saw it but after several viewings on DVD and Bluray, I really think it’s one of the best spy flicks of the decade. 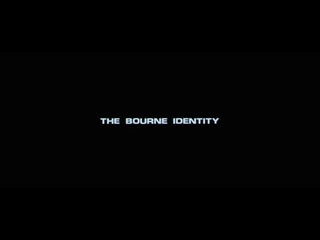 The Bourne Supremacy is still my favorite but Identity is better than Ultimatum. Thank you very much, Ted. 🙂 As someone who’s read the novels that’s great to hear. I agree it’s become one of the best spy flicks of the decade! Wonderfully thorough review! I was saying “ditto” in my head an awful lot while reading. 🙂 I saw this one (and its sequels) in the theatre and was hooked right away. I own all three and watch them frequently. I was astonished to see that this original was from 2002. Either it’s aged well (or I’m just getting old???) but it doesn’t play like a 12yo film. I’m always surprised that it gets less love than the sequels. I like them all but it’s the first film I tend to re-watch most often. No real complaints from me, though. How often do you get a really satisfying trilogy instead of money grabs with less and less going for them? I, too, thought the books got worse as they went (I read the first three only so I don’t know about the newer ones). However, I wasn’t a huge fan of the bourne identity book so not sure where the series in print had anywhere to go for me. I think there is a lot to like about this film but one of my favorite things is the hand to hand combat. 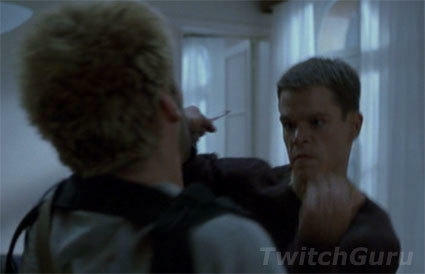 I like how Bourne uses many methods to obtain his ends. I get bored with action films that rely heavily on guns and/or explosions. It requires little expertise to shoot someone or blow something up. I like action films that showcase talent and creativity and I think the Bourne films do that. Glad you enjoy this one, too. Looking forward to book chat since we seem to have experienced the book differently. Thanks! I had a feeling you were a fan of this and the whole trilogy, Rachel. ‘Identity’ certainly does not play like a 12 year old flick, indeed. Me, too, regarding that it doesn’t get the love it truly deserves. Makes me wonder what this would have become in another filmmaker’s hands. Ludlum, with his stage background, did write very theatrically. Rereading that became very clear this time around. Still, for the time, his style carved out a large following among spy thriller readers, and away from Fleming and Le Carre. The latter, as you recall, I have a problem with. Purely on writing style, not content. Yeah, wasn’t the hand-to-hand combat something’! It’s certainly one of the best things about this adaptation. Blew me away the first time I saw it. By the way, if I remember correctly, this brutal close-quarter combat and knife fighting of the Filipino Martial Arts was also deployed in another film that you can’t stand. Wait for it…The Hunted (2003)! This movie helped redefine modern action cinema and, even though it’s the weakest in the trilogy, it’s still a fantastic ride. The film has its merits :-). And what a ride! Many thanks for the read and comment, my friend. Nice job on this review! Just re-watched the Damon films and the first still holds it’s own and is still a rush to watch. Still relevant and influential, too. I like how you pointed out the amnesia elements in so many other highly regarded works. Good observation and I enjoyed much of the back ground info and trivia. Great post! Oh my, I missed this post!! Wonderful review Michael. It’s true that it changed the action (specifically spy) franchise in making it gritty and no-nonsense. Oh I didn’t know Ludlum was a former Marine turned theatrical actor and producer, what a cool trivia!